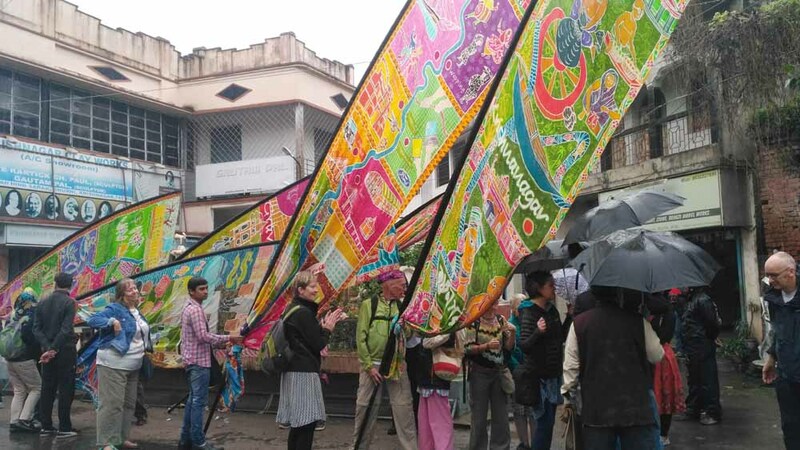 Krishnanagar, Dec. 9: A group of contemporary artistes, authors and historians from Bengal and London walked in a rally today in a bid to rediscover the cultural relationship between Kolkata and London that developed over the years along the bank of river Hooghly and Thames. The walk which is part of 10days walk titled “Silver River India Walk” that began from Azimganj in Murshidabad district on Thursday, would conclude at Victoria Memorial Hall in Calcutta on December 16 with stop over at 10 important heritage places like Barrackpur, Chandannagar, Batanagar located along the bank of Hooghly river. The walk has been undertaken by British Council in India in association with UK based art organization Kinetika and India based Think Arts with support of active partners like Union Ministry of Culture, West Bengal tourism department and other organizations to mark the 70th anniversary of India’s independence and to pay tribute to the country’s rich cultural heritage. 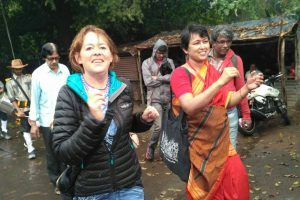 During the 10days walk the these artistes and authors will capture and interpret the experiences of their journey along the mighty rivers and raise an awareness among people about Indo-British relationship by engaging diaspora. The walk conceived Ali Pretty, an art Director with Kinetika said: “Kolkata being a slice of Bengal has close proximity to London for over years. The two rivers – Hooghly and Thames on which these two cities located made this relationship closer. There are many similarities in the culture and characteristics of these two towns. Both the towns has similar suburbs at its downstream. One can find similarity with Batanagar with our East Tilbury as both famous in shoe making, Barrakcpur can be identified with our Greenwich for the cantonments. Our endeavor is to explore and rediscover this relationship through cultural exchange, interpretation of contemporary art, literature and using the diaspora at the same time”. Ghurni and learnt about the making of exquisite craftsmanship of the artisans there. Kevin Rushby, a travel journalist with The Guardian said: “To me it is a great experience to see the artisans in Ghurni working on exquisite and delicate art-fact with such great skill and fineness. Stories of these artisans needed to be known by people live on the bank of Thames too”. 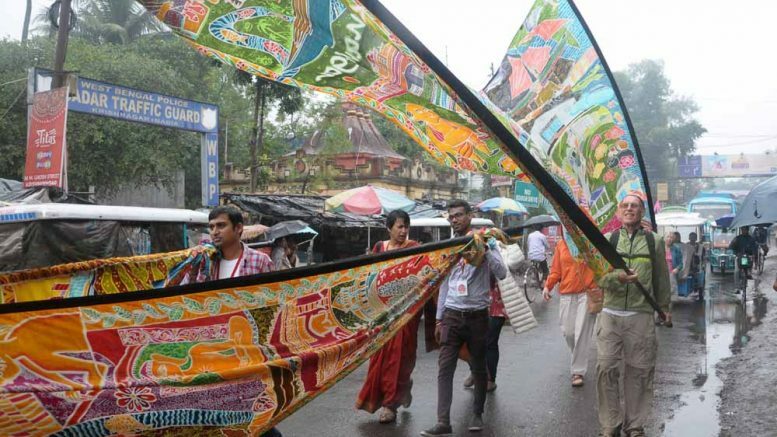 The artistes today walked about 5km in the town holding 10 hand painted silk-scrolls of 6-meter length, each depicting ‘Pata chitra” inspired by common themes that capture British and Indian intangible culture. After visiting the clay model works, the team members experienced the unque craftsmanship of “Daker saaj” at the workshop of Ashish Bagchi. They also visited the palace of King Krishna Chandra Roy’s palace. Tamal Banerjee, a novelist with Bengal team, who led the walk today said: “This is a very ambitious project. I am really excited to be a part of it. I hope this would explore the unique relationship between London and Calcutta through artistic exchange between communities along the Hooghly and Thames Estuary”.